No one tried to cheat this year (nor last,) though there is still a problem with people reading the directions on how entries are to be prepared and presented. I guess when people see a lot of lists on the page, they just don’t feel like reading everything. 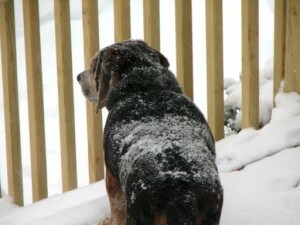 As for not judging next year, the reason is to get some fresh eyes in there. This is what most fairs do (or should do.) If you judge the same contest enough times, you get to recognize people’s work, and that can form a bias. Newer entrants tend to be all over the map with entries as they are just learning all of the wonders of a craft, while people start to specialize as they gain experience and find the areas of the craft that they really like. 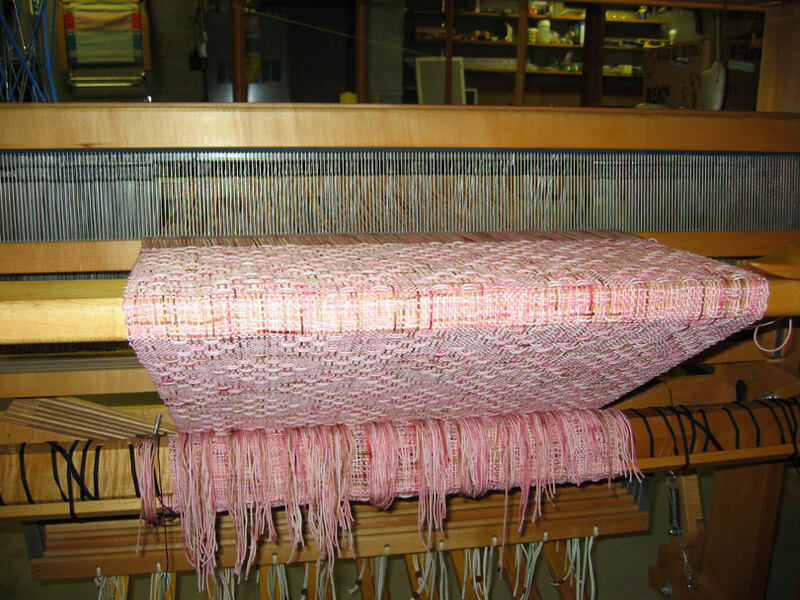 With the experience also comes (hopefully) better results, so the better items in a category (say table linens) tend to come for a certain group of weavers that the judge will eventually come to recognize particular weavers due to their choice of structure, color, fiber, etc. In all, it has been a great experience. 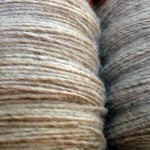 I get to fondle lots of fiber for a day, and it doesn’t cost me anything to do it. Sounds pretty good. For the past few years, I have been mainly doing socks. While I did a few pairs of socks in my early knitting “career”, it wasn’t until I got Sensational Knitted Socks that I really got into knitting socks, and specifically toe-up socks. When anyone asks me for a reference book on socks, SKS is the book I recommend without reservation. It just opened my eyes to see all those numbers together and see the pattern of how it all worked out. Now, why toe-up? 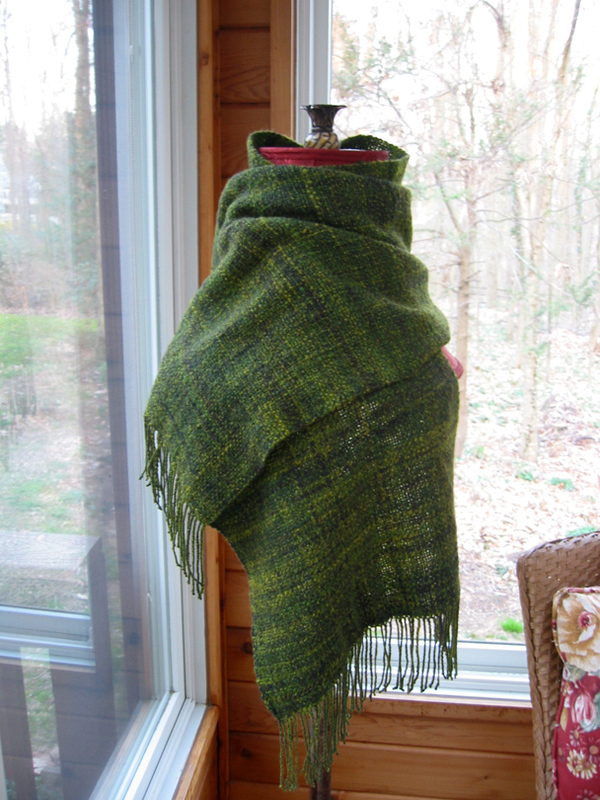 I believe that I have talked about this before, but for the sake of having this all in one place, I put it here too: It is better for me to short change the leg in length than it is for me to short change the foot in length because of the fear of running out of yarn. I have a big foot, at least as far as sock yarn manufacturers are concern, and the sock yarn that I like can be kind of pricey. 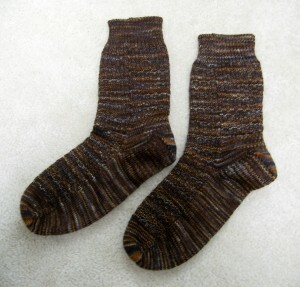 Buying two skeins of a pricey yarn just to make one pair of socks is a lot even for a spendthrift like me. (Ok, I am really not a spendthrift, but I do like nice yarn. MMMMMM, yarn!) Doing toe-up means that I will have a pair of socks that fit without fear of buying a second skein or ripping out and re-knitting. 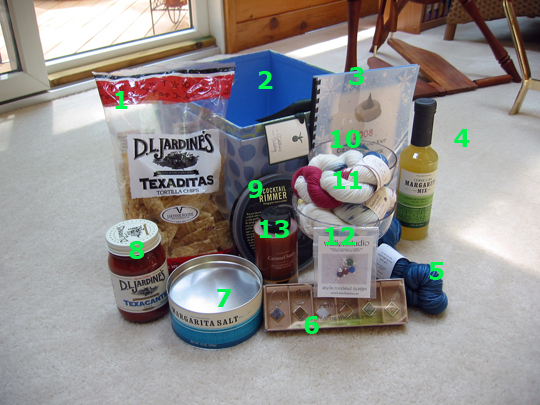 So here is what I generally do for socks: First, I have a magic number for my sock yarn – knitting needle pairing. This magic number is the number of stitches used around most of the leg and most of the foot if knitting stockinette or rib. 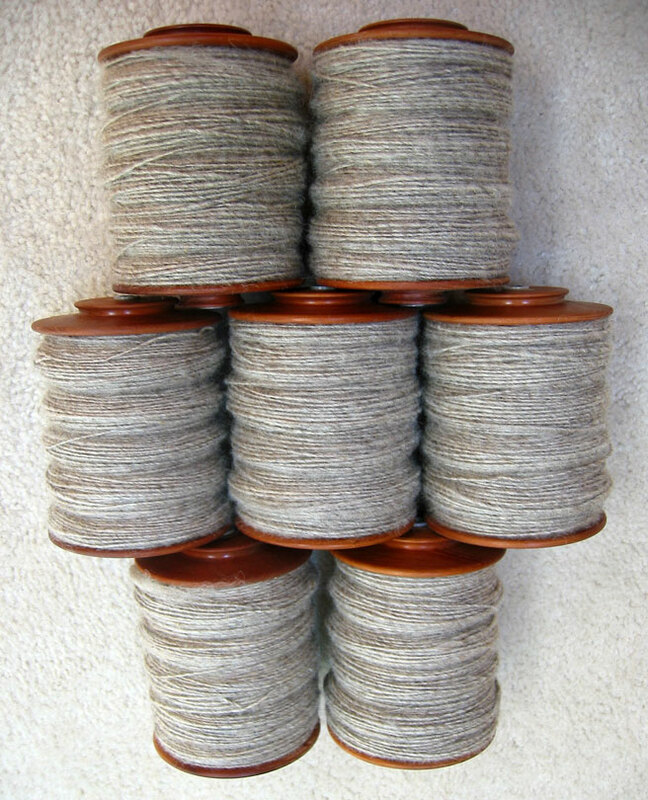 As an example, some sock yarns, I use 64 stitches on 2.5 mm knitting needles as my magic number. 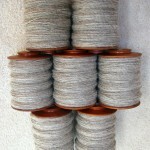 For some thinner and/or softer sock yarns, I use 72 stitches on 2.25 mm knitting needles as my magic number. 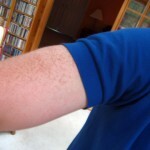 The development of this number comes through testing and personal preference. For socks, I like a firmer stitch than I would for a sweater. Please note, these numbers are not carved in stone. If I need to add or subtract a stitch to get a stitch pattern to workout correctly, I will do it. Knitting is not an exact science, and a stitch here or there is probably not going to make the difference in whether a sock will fit or not. If you’ll notice, both of my magic numbers are divisible by 8. This makes a lot of calculations that I do for toes and heels easier. I will get into those calculations in other posts. Being divisible by 8 (and the latter one being divisible by 9), also makes putting together stitch patterns for socks easier. Math is a wonderful thing! Once I am done the toe, I am now up to my magic number; and I work the rest of the foot, with the top of the foot being in pattern, while the sole is in stockinette. 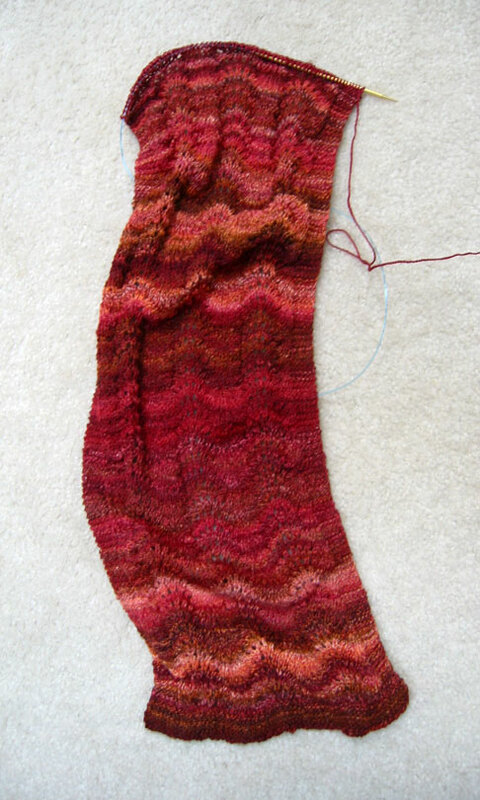 But this leads to a big question, when do I stop knitting the foot, and start knitting the heel? 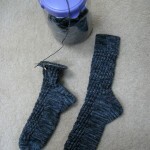 This depends on two things: foot length and type of heel being knit. Foot length is pretty self-explanatory. When knitting socks for myself, I just use the length of my forearm as a reference for the length of my foot, since they just happen to be the same. Oh, the wonders of the body! 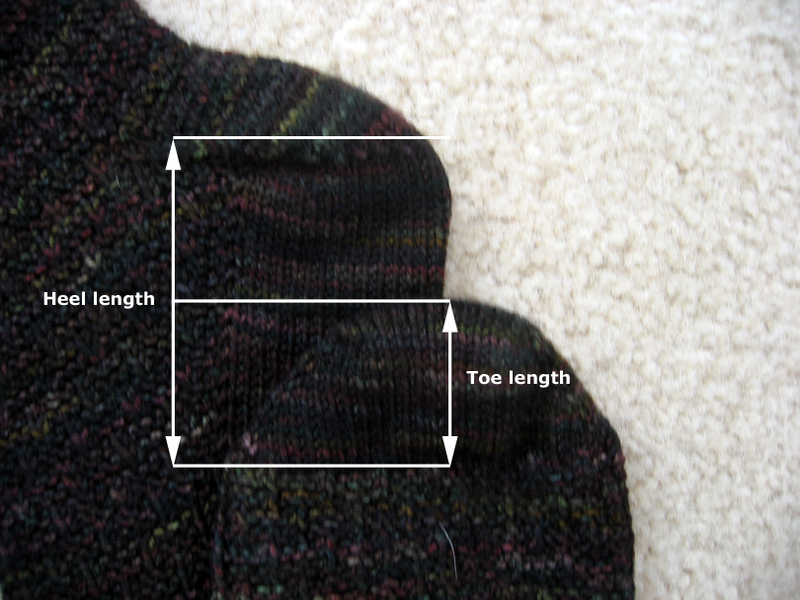 If I am making socks for someone else, I use the charts in SKS that convert shoe size to various foot measurements, including foot length. There are conversions available on the web as well, just do a Google search on “shoe sizes in inches”. The type of heel that I am going to use for the sock matters in when I stop knitting the foot and start knitting the heel because different heel designs are of different lengths. (Foot length minus heel length equals when I start work the heel.) I generally choose among three heels: short row heel, heel flap gusset, and, most recently, the results of my heel experiment. 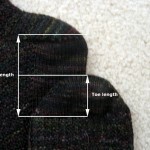 In all three cases, I use something that I have already knit to determine this length: the toe. 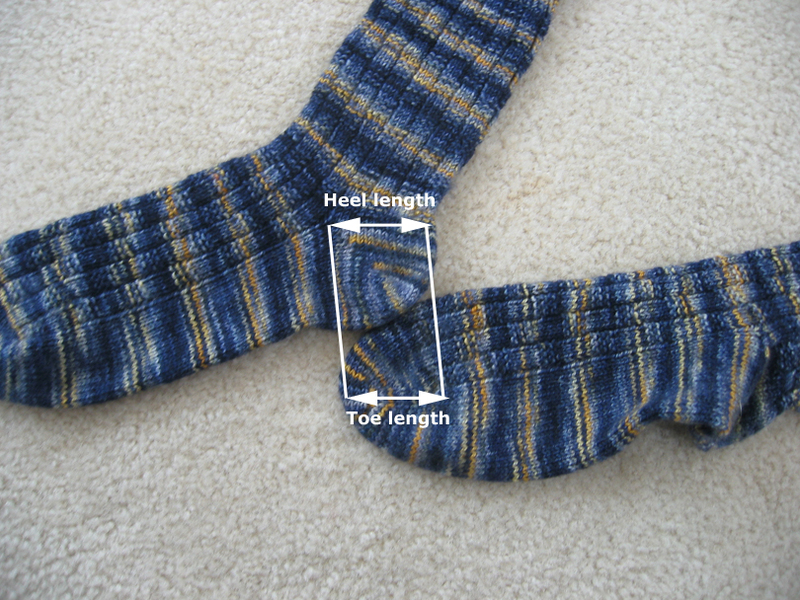 For the short row heel, the heel is pretty much the same size and shape as the toe, so I just use the length of the toe as the length of my heel. One thing that you will notice in this photo and the next couple is that this is all approximation. 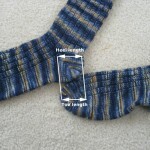 I really don’t like to break out the ruler or tape measure when knitting, which is why I use the toe for my measurements. It is a matter of convenience. 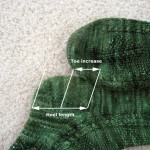 In all cases the length of the toe is going to be a little longer than the heel measurement. Again, since knitting is not an exact science, this is ok. When faced with the choice of going a couple rows short on foot length as opposed to going a couple rows long, I always choose short, because the knitting will stretch to make up for the difference in length. For me, having my knitting stretch a little (which makes it wear a little faster) is a better option than having my knitting bunch up under foot (which will cause blisters and other general discomfort.) That said, my socks last me for years. My oldest pair of socks finally wore out after 15 years of use. 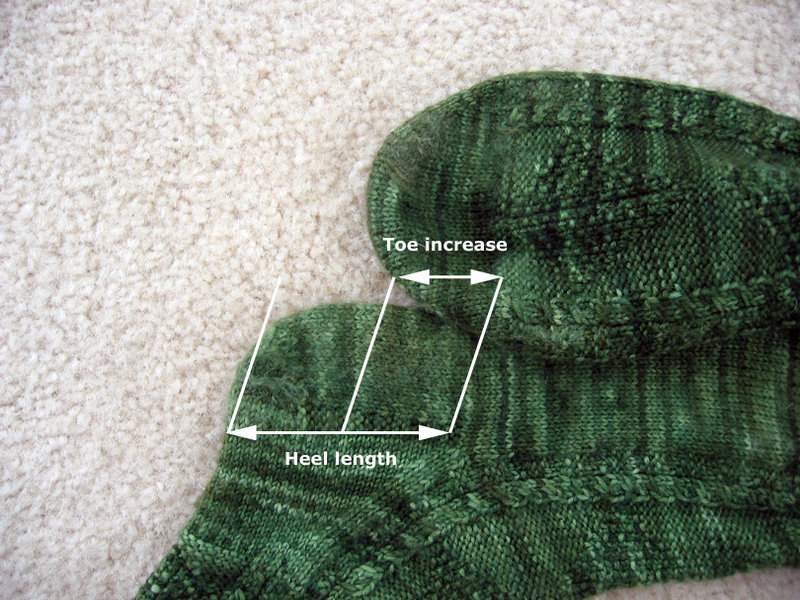 For the heel flap heel, I don’t use the entire toe length, but just the measurement of the increases for the toe doubled. Why only the increase portion? Because I do a slip stitch pattern (eye of partridge) for the heel flap, which shortens the length a bit. 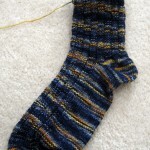 Finally, for the heel experiment, it is the length of the toe doubled. 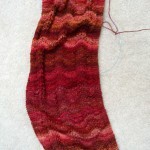 I will go into more detail about the construction of the heel for the heel experiment in another post. By the way, which heel I choose to knit is more about whim than anything else. Sometimes I feel like a nut; sometime I don’t. That is not to say that one heel doesn’t have certain design advantages over another, just that it really doesn’t play much of a factor in my choice. At this point, all of my decisions are made. 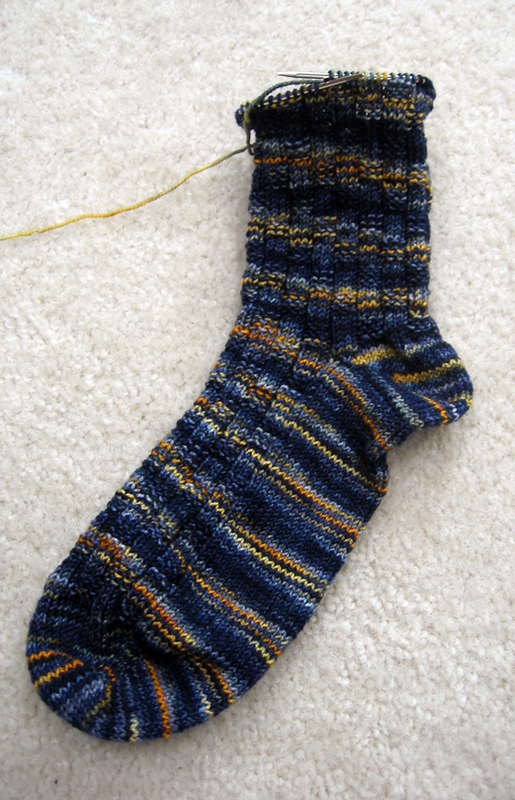 I knit the heel and start the leg, back to the magic number I was at just before the heel. There has been a lot going on around here, but not a lot to show for it. 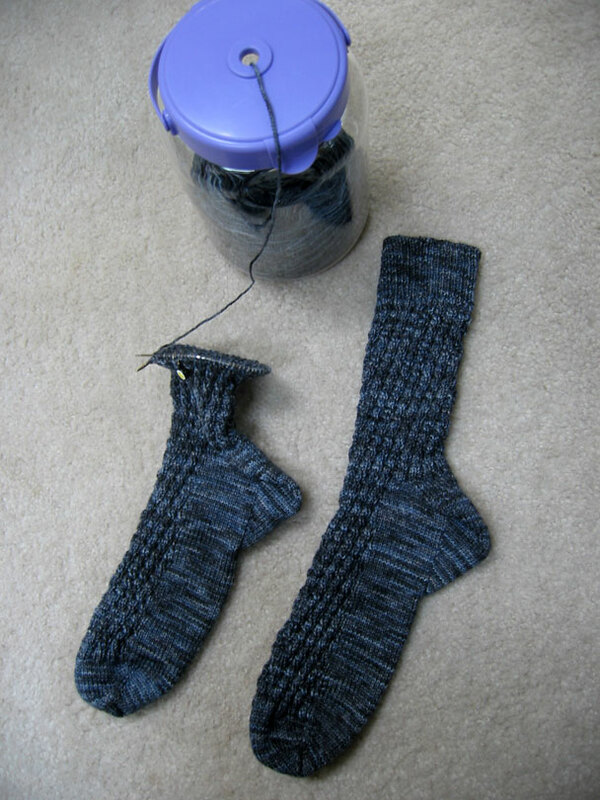 A little over a week ago, I finished writing up the pattern for Sheila’s sock club so that everyone’s favorite test knitter could start knitting it. I still have some hints and tricks that I want to put in it, but the pattern itself is done, barring any corrections. 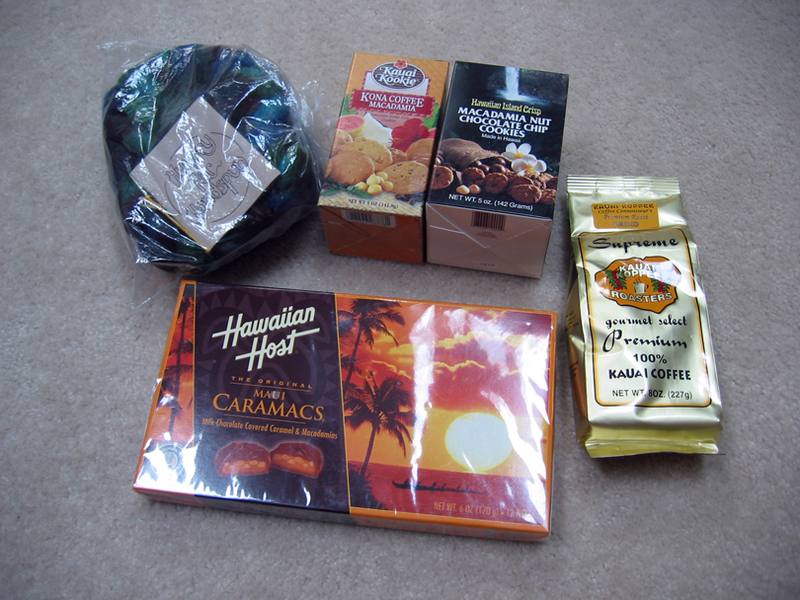 I have received the winter edition of yarn from Sheila. And? SQUEEEE! But again, I can’t show you that yet. 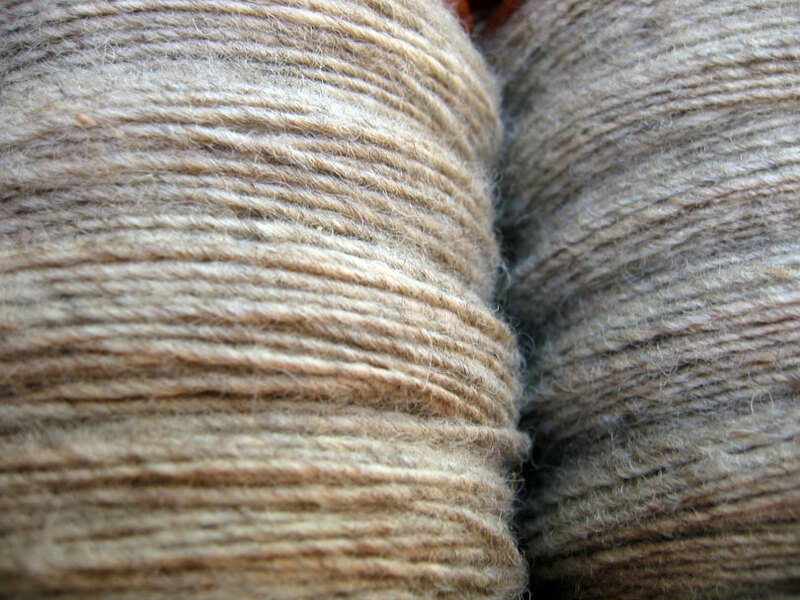 I finished spinning up the single last night of the first course of Hungry for Handspun‘s Fiber Feast. 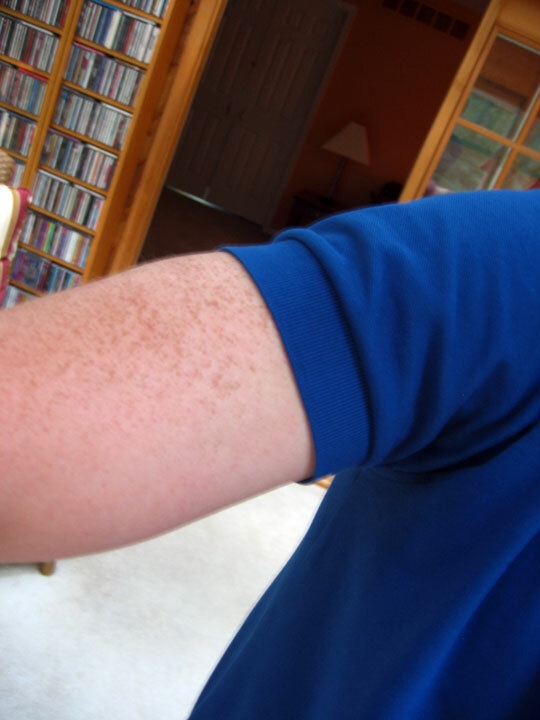 I would show you, but it really doesn’t look much different than the last time I showed you. I am figuring on chain plying. What I will do with it, after that, I am not sure. Finally, I am running again in the Komen Maryland Race for the Cure, in Hunt Valley, MD, on October 18. Unfortunately, this year I am not able to offer any prizes, but I did start the ball rolling by selling off some of my stash on eBay. The last buyer paid me this past week, so all of that is done and out the door. I will write up a lessons learned on that later. If you would like to support me in the race, just go to this link. Just so you don’t go thinking our trip to P-town was just a maddening re-creation of Plane, Trains, & Automobiles, subbing Busses for Trains, here are the photos from the whale watching tour we went on. Stay – Crowne Pointe Inn thanks, Dave! Areas like entertainment are more subjective, I think, so I will just say that the dance clubs were good, and we really enjoyed the shows by Jennie McNulty and Miss Richfield 1981. When we got home, there was lots of mail waiting for us. 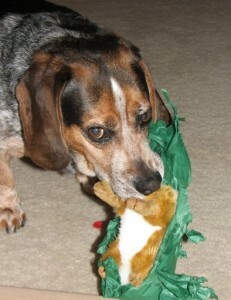 In that mail, was a package for me! 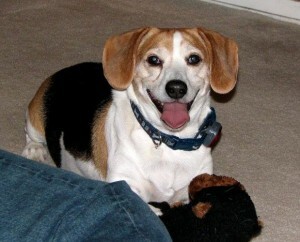 From Opal! Coming soon! 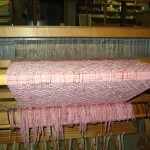 Knitting, spinning, and weaving! Oh my! 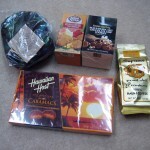 This is all part of the Sizzling Summer Swap at Sheila Rovelstad Designs group on Ravelry. I should also mention that I believe I got sticky bun and caramel frozen coffee beverage from her at a knitting meet-up a few weeks ago. Thank you, Stacey! It is all great. I can’t wait to dive in!